When we domesticate animals, we alter their evolutionary development to favor the traits that we find most desirable. Usually, that process takes hundreds, even thousands of years. 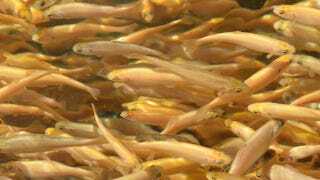 But fish hatcheries can scramble a species' genetics in a single generation. In fish hatcheries, thousands of young are born in a tightly enclosed space, a situation utterly unlike the wild rivers to which the species is adapted. We've known for a while now that, when hatchery fish are returned to the wild, they often prove significantly weaker and less fit than their wild-born counterparts, and they have significant trouble interbreeding. That's especially worrisome for threatened fish populations, where an influx of weaker genes could spell disaster. But what's behind this sudden weakness in hatchery fish? Three major possibilities have been put forward, and researchers at Oregon State have conducted a 19-year study to find out which one is correct. The first is the most straightforward: there are some environmental factors in the hatcheries that weaken the fish born there. The second is our old friend inbreeding - the hatchery fish are forced to breed in close quarters, and which means lots of potential breeding with close relatives that, over a few generations, weakens the population's overall fitness. The third and final explanation seems unlikely, but turns out to match the evidence most closely - the fish are actually evolving under the pressures of what's known as domestication selection, and they're doing it phenomenonally quickly. In this scenario, the human-created environment presents such extreme evolutionary pressures that the population is forced to adapt or die, changing the gene pool. In many animals we've domesticated, such selection has made the species smaller and less intelligent and generally unable to survive in the wild. Still, the domestication of cows, dogs, and other species took many generations and hundreds of years. In the fish hatcheries, the salmon gene pool complete reorganizes itself in just one generation. For that to happen, the selection pressures inside the hatcheries must be incredibly intense, as pretty much only those fish that happen to be ideally suited to conditions inside the hatchery are managing to pass on their genes. All the others are either dying young or not managing to reproduce, as that's the only way to get evolution working at this sort of warp speed. The researchers aren't totally sure what selection pressure is causing such intense selection pressure, though they suspect it's an obvious culprit: those fish that can handle the intense crowding of the hatcheries are the ones that survive. Since such tolerance wouldn't be of much use out in a wide open river, most salmon wouldn't be naturally comfortable with that extreme crowding, and it's apparently so bad for them that they're not managing to pass on their now unsuitable genes. While it's amazing to see evolution happening so quickly right in front of our eyes, particularly with such a complex organism, this has some serious implications for salmon conservation efforts. Billions of captive-reared salmon are released into the wild each year on the assumption that they are just as fit as their wild counterparts - previous studies had revealed that wasn't the case, and now we know just why that is. If this finding holds up for other hatcheries, then it means that captive-reared fish pose a serious threat to the health of the wild population going forward. It seems domestication is an even more powerful tool than we ever suspected. Via PNAS. Image of trout hatchery by Lilyana Vynogradova, via Shutterstock.